After concluding a six-month community-led master plan process, the Rockford Park District has revealed a five-year strategy to reinvest in several park district programs and services. The process included “visioning sessions” held throughout the city, where citizens could ask questions and provide feedback. More neighborhood parks, expanded youth programs and updating aging infrastructure topped the list as RPD amenities most valued by community members. Other programs and services important to the community included: open space and trails, arts and cultural programs, the Nicholas Conservatory and Gardens, outdoor education, swimming and community-wide events. “We received some very specific guidance from our community in terms of what they want their tax dollars going toward,” said Rockford Park District Executive Director Jay Sandine. “Getting back to some of our core services, focusing on youth, teens, and families and downsizing the District is something we heard loud and clear. “Heading into 2019 budget planning, the District is anticipating a nearly $800,000 deficit so in order for us to add and reinvest in what our community is telling us, we have to reduce our footprint and live within our means. Our goal is to have a vibrant park system that is helping to improve the quality of life for the citizens we serve,” he added. Park District budget woes stem from a declining tax base and a reduced revenue stream due to population and demographic shifts within the district. Several proposals for helping the District’s bottom line were offered through community feedback and are now being reviewed by the RPD’s Board of Commissioners. The commissioners are set to decide on the priority of the proposals at their Sept. 11 meeting and then implement a master plan in the next five to seven years. Alternative, new, or non-traditional year-round programming to attract new, current and non-golfers along with expanding food and beverage service, merchandise and adding gaming at Aldeen Golf Club. Sell or lease specific District owned property with no recreational value such as various District owned buildings and sell land in prime development locations. Amid the RPD’s financial concerns, the brand new The Rockford Bank & Trust Pavilion at Aldeen Golf Course, which opened in mid-August, is poised to be an important source of revenue for the park district owned golf course going forward. According to Laura Gibbs-Green, public relations manager for the Rockford Park District, the Pavilion is anticipated to generate around $150,000 worth of income annually. 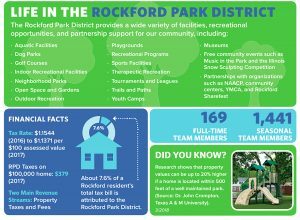 For more information on the Rockford Park District’s Community Led Master Plan Process, visit www.rockfordparkdistrict.org/news and click on the “Rockford Park District Reveals Plans to Reinvest in Neighborhood Parks, Youth, Aging Infrastructure and Other Community Priorities” link.